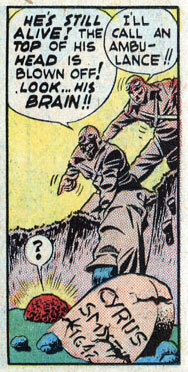 I love how the brain appears just slightly curious and perplexed about the situation – all from one thought balloon! Knowledge is power! Knowing is half the battle! I love the optimism of the guy who wants to call an ambulance. I always think ppl are still alive when the tops of their heads are blown off! And their brain is lying intact on the ground next the blown off head…. You have to have a medical degree to know that too! Either this guy is a complete idiot or his super power is seeing thought bubbles. I would like to know how to tell if some one is alive or not by looking at their brain. You can tell the brain is alive by the telltale ‘?’ thought bubble and yellow glow. Although I believe that what we’ve actually got there is a word balloon, which means the disembodied brain is making a ‘?’ sound. This panel is rich with complexity. The actual story behind what’s going on is even more random than this one random panel. The guy on the headstone, Cyrus Smythe, died in the 1600’s but because he was an eeeeevil scientist, his brain stayed alive while his body rotted away. Why? COMICS, that’s why! So flash forward to 1942, and this American soldier get exploded by a bomb, blowing the top of his head off and plopping his brain out. By amazing coincidence, the crater of the bomb opens Smythe’s grave, where his brain — now exposed because the corpse rotted away, happens to be waiting. So naturally the ambulance guys pick up the fresh American body and the old English brain, and put the latter in the former. Voila, Smythe has a new body and resumes his nefarious scientific studies! But not as awesome as that one “?” balloon.